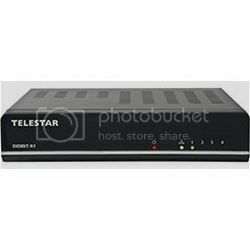 IPTV Satellite Receiver Telestar Digibit R1 Sat to IP Client , Satellite distributions are nothing special several devices are supplied via a multi LNB or multi-switch with digital satellite signals, so that each participant has the full diversity of stations available. The Telestar Digibit R1 builds on this point and complements the possibilities of the distribution of digital television signals to a decisive factor: the network. To this day, watching TV on the Internet, IPTV is considered known, as a distribution of TV content and movies via the WWW and is thus actually in contrast to the classical transmission platforms such as cable, terrestrial or satellite – at least until now, because: Telestar Digibit R1 allows the distribution digitally via satellite radiated radio signals over the home network. so-called “clients” such as PCs, laptops, tablet PCs, smart phones (with appropriate software or app), IPTV Receiver, TVs or game consoles. The DLNA compatible Telestar Digibit R1 sets the DVB-S signals to a network. This is of course in the best picture and sound quality, which also includes HDTV and Dolby Digital naturally. If supported by the client, additional functions such as calling up Teletext and EPG data, the recording function, or a time-shifted playback of the TV program can (the so-called shift) can be used.